Back in early December I was out one Friday morning doing some errands. I was waiting at a light when I noticed this on the light pole across the street. Hum, I thought, crows. Nothing unusual there. We have a lot of crows around here. Not as many since West Nile came to town, but still a lot of crows. Then I looked again. Weird looking crows…Oh my! It was three vultures! Now that is a little unusual! So I had to pull over and take a few pictures. The vultures were unfazed by my curiosity. The pictures did not turn out that great due to the angle of the sun and my lack of ability. I tried to get a better angle but when I walked that direction I encountered an even bigger vulture standing on the ground. He appeared to be the one with the prime position regarding what ever was dead and attracting so much attention. Vultures are pretty big birds and I did not want to have it out with him or get any closer to what he was eating. Yuck!! Lately I have been feeling like I am living in a nature movie here in my little city. If it isn’t an owl hooting it is the coyotes howling and yipping. If is isn’t the killdeer making lots of noise at night it is the bats swooping in over the pool to catch bugs. 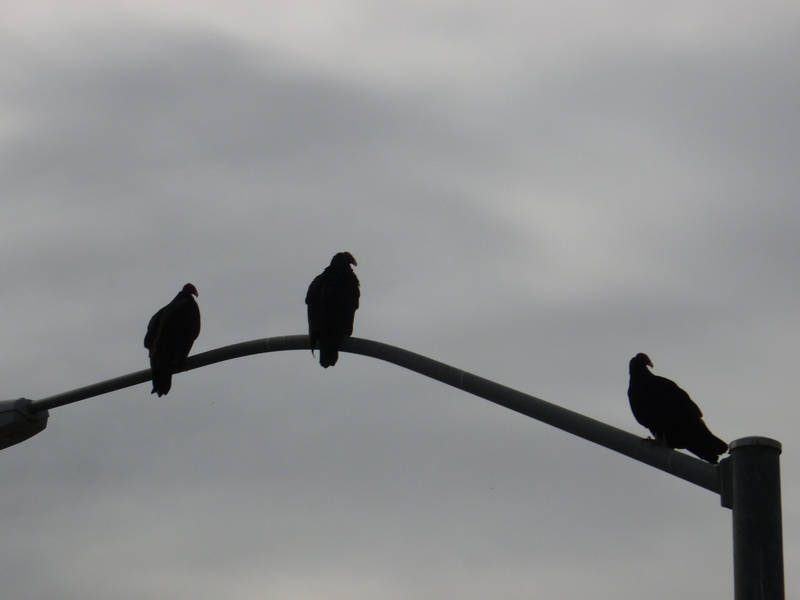 Or maybe it is three or four vultures hanging out at Limonite and Baldwin. I feel like singing “Born Free,” but that is probably dating me! How wonderful, to be living in a city with so much nature around you. We see them quite a bit. They are not the most attractive bird! I just saw on the internet news that a lot of vultures are hanging around all of a sudden, and now I see that they are hanging about in your area. I wonder what’s going on. 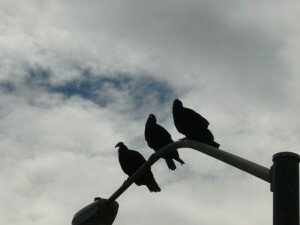 Oh, btw: I really like your first picture of the birds…it looks so mysterious! Plus, I can tell they’re vultures because one of them has its head turned in a side profile.